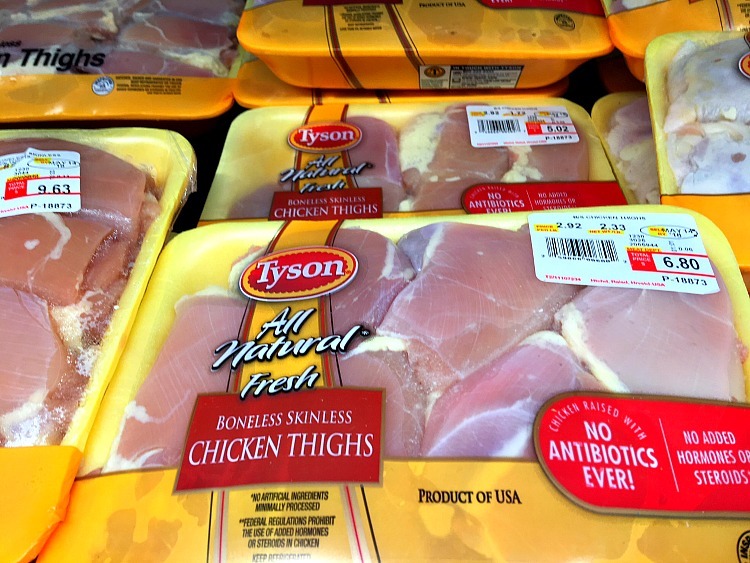 This post is sponsored by Tyson Foods, Inc., but the content and opinions are my own. I love this time of year. Spring has sprang, sprung… It’s here and summer is on the way! I love the great weather, the extra couple of hours of daylight, more frequent trips to the beach and longer days by the pool. But, what I REALLY look forward to is… grilling, baseball and BBQ dry rub!!! 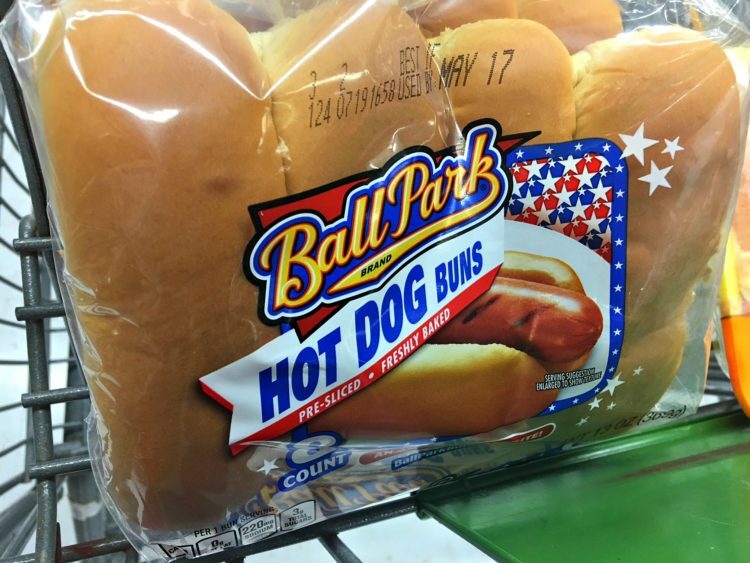 When I was a kid, my dad and I would grill and listen to our favorite baseball team on the radio. We lived in Oklahoma, so there was no pro baseball anywhere, so we made due. It was a pretty cool bonding experience. Even though we weren’t at the game, it kind of felt like we were. You have to really love baseball to listen to it on the radio! 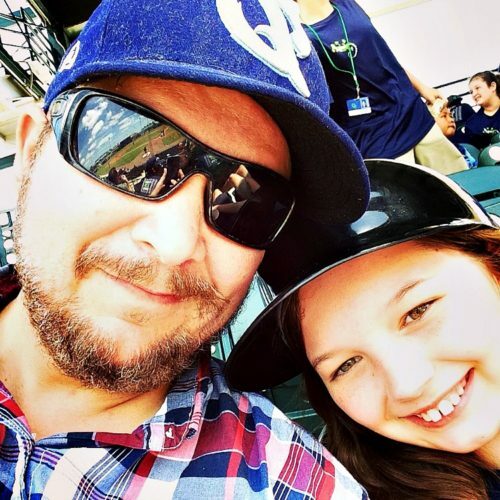 These days, my daughter and I go to games together and every once in a while we like to have a home run derby in the backyard. 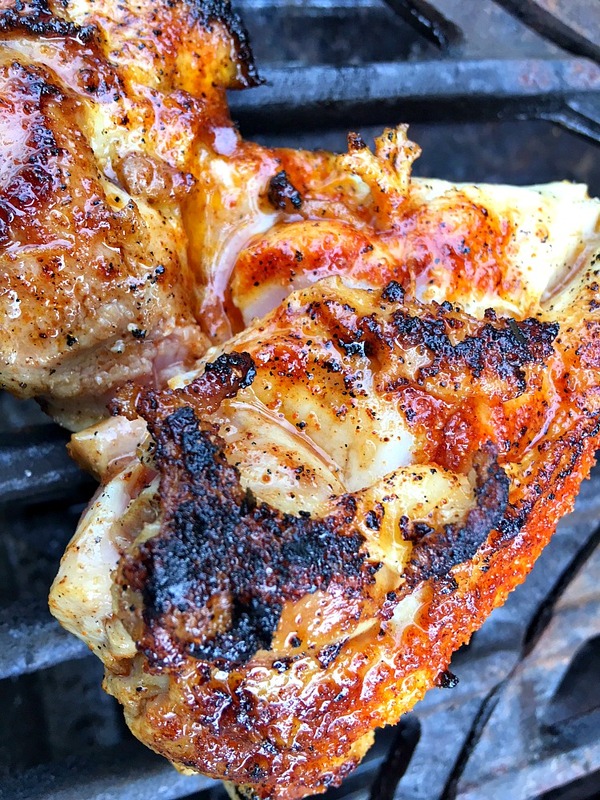 Now, I’m a HUGE fan of Dry Rub BBQ and my chicken is famous (Well, to me it is. Let me have my dreams!). This dry rub can go on every meat imaginable and I’ve even been known to sprinkle it on vegetables. 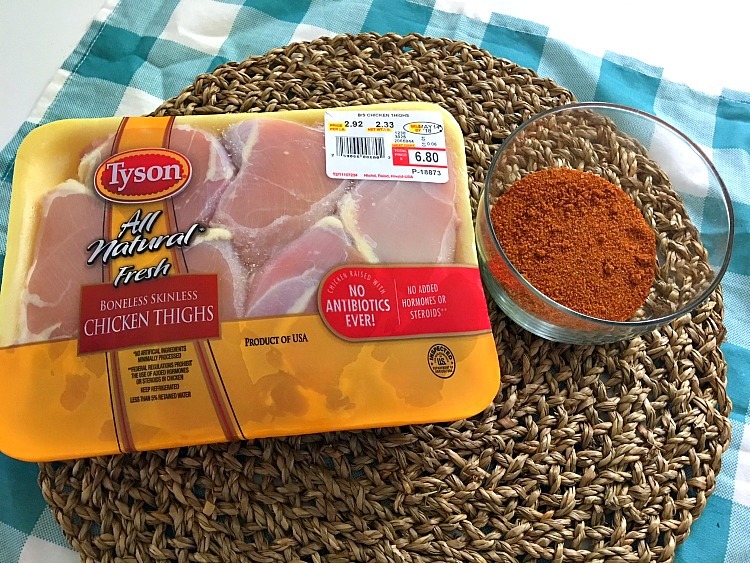 This weekend I grabbed some Tyson® Boneless Skinless Chicken Thighs and made a fresh batch of BBQ Dry Rub. Mix ingredients in a bowl and then apply liberally to both sides of your chicken. 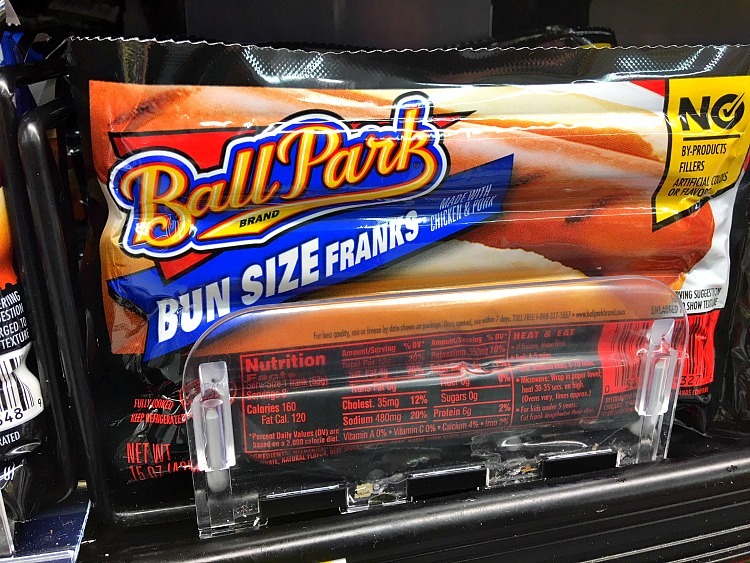 No matter what I’m grilling, I always have a few Ball Park® Hot Dogs ready to go. 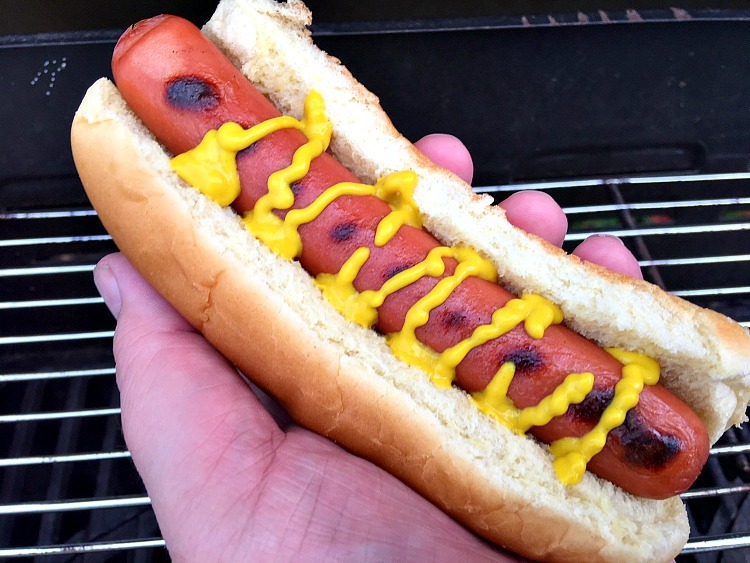 A grilled dog is one of those foods that I consider absolute perfection. 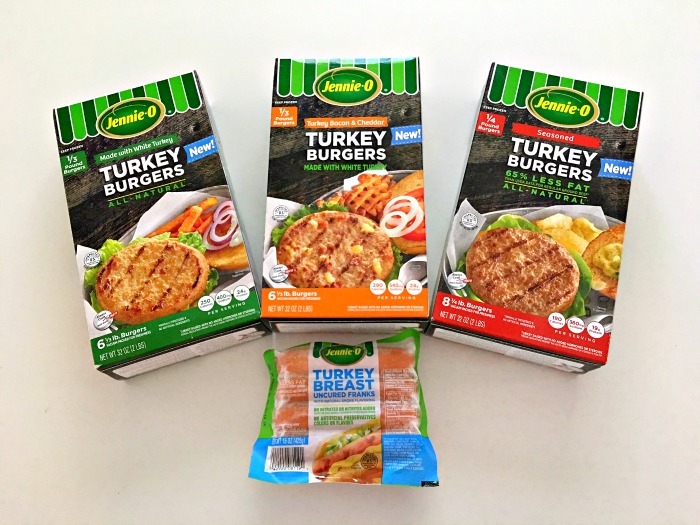 Throw it in a bun, put a little mustard on it… It’s a little bit of heaven! 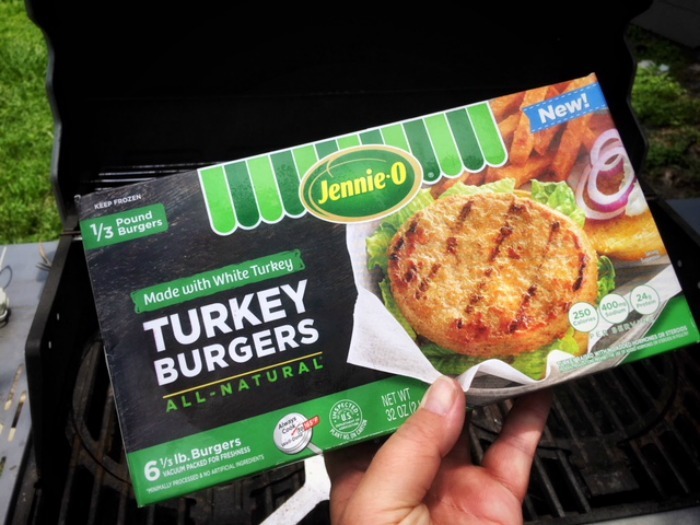 When you and your family fire up the grill this summer, swing by your local Walmart to pick up all of your edible grilling essentials! No family cookout is complete without a cool glass of Iced Tea. 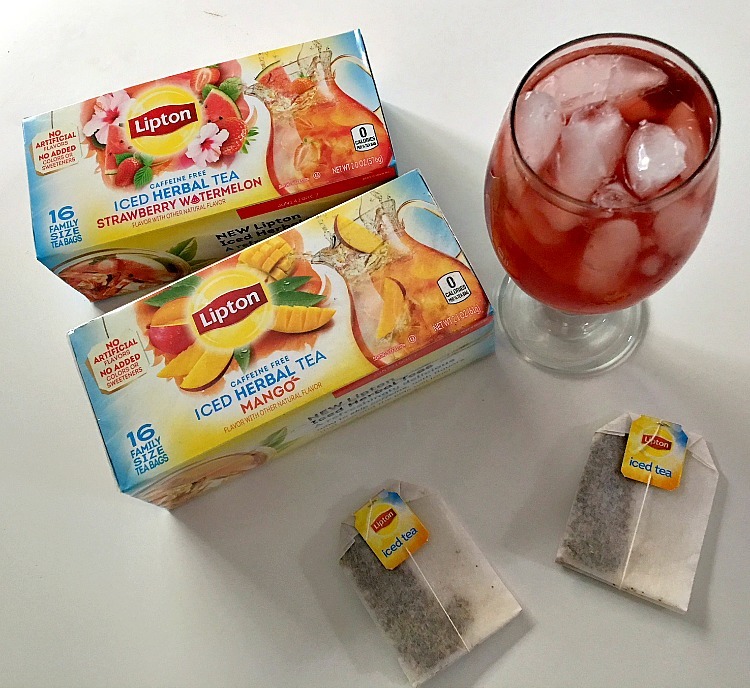 My wife and daughter are loving the NEW Lipton®Iced Herbal Tea Bags. Both the Strawberry Watermelon and the Mango are crisp, refreshing and a great alternative to sodas or sugary drinks. They will both be available at your local Walmart soon! 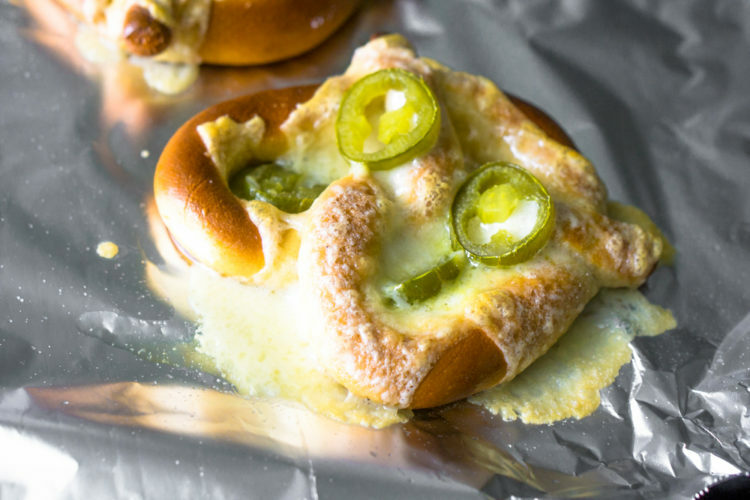 This post is sponsored by Black Creek but the content, opinions and love of the Grilled Jalapeno Cheddar Cheese Pretzel are my own. 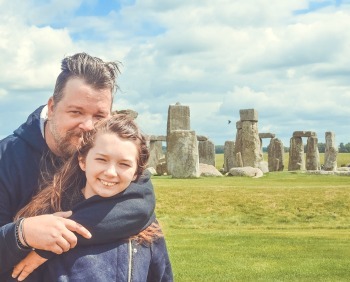 My daughter just had her last day of school. Now that the summer is upon us, I’m going to need to come up with some fun, easy and tasty snack recipes. She’s thirteen-years-old and is starting to get very interested in cooking. So, I challenged her on some recipe ideas. 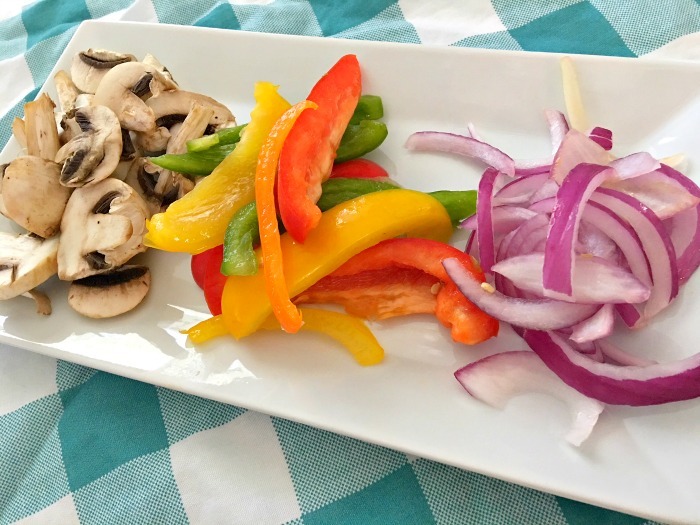 I said that I would let her cook whatever she came up with, but I got to make it first and decide if it was going on our summer snacking menu. 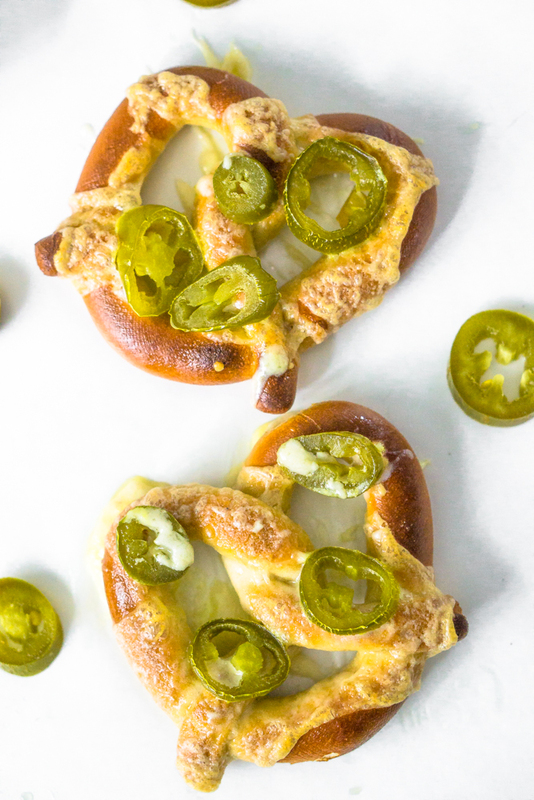 Right out of the gate, she came up with this little gem… a Grilled Jalapeno Cheddar Cheese Pretzel! I would’ve put money on the fact that she was going to pick something with cheese on it. Our family is a bit snobbish about our cheese. It’s one of those food items that we don’t skimp on. Every time we find ourselves in a new state our country, the first thing we love to sample are the regional cheeses. Two summers ago, we spent a week in Door County, Wisconsin. They had some of the best cheese that I have ever tasted! Wisconsin cheese is just on a whole different level. 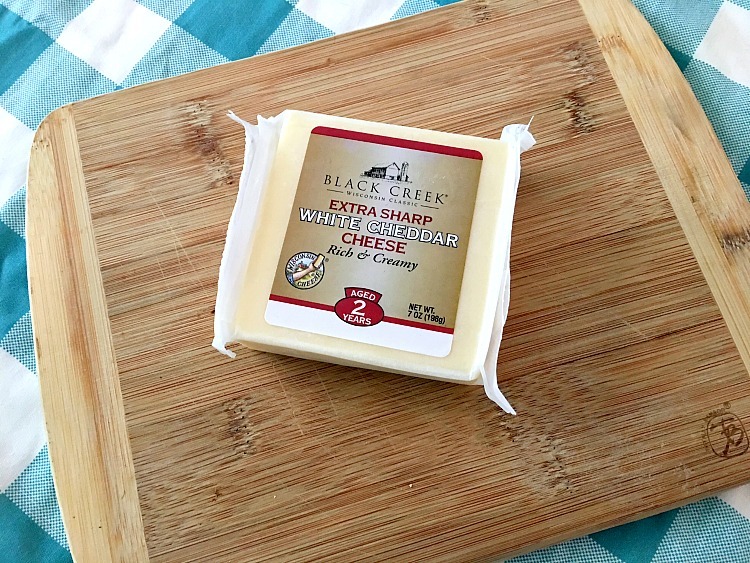 We like the Black Creek® Extra Sharp Cheddar that’s been aged 2 years. It’s like bringing the best cheese in Wisconsin home with you. Put them on a hot grill until soft and warm. Put pretzels on a baking sheet. 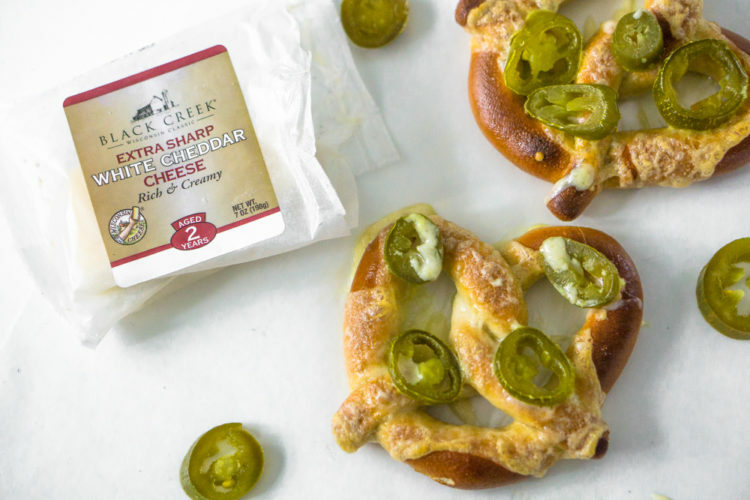 Put 3 thin slices of Black Creek Extra Sharp Cheddar (Aged 2 years) on each pretzel. Broil for 3-5 minutes or until crispy (Keep an eye on it). 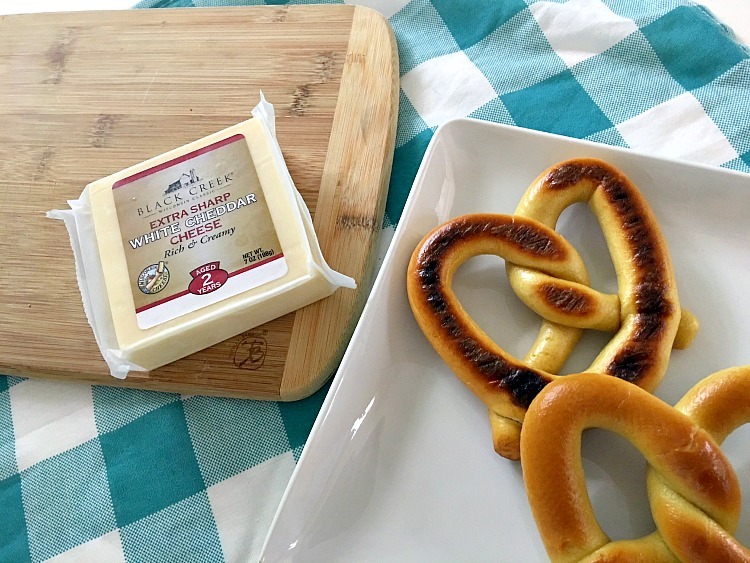 When you break out your grills this summer, make sure to pick up some Black Creek Cheddar! In my house, we really love… Star Wars and Mickey Mouse! So, I thought about how I could come up with the ultimate cookie recipe that showed some love for both of these things. 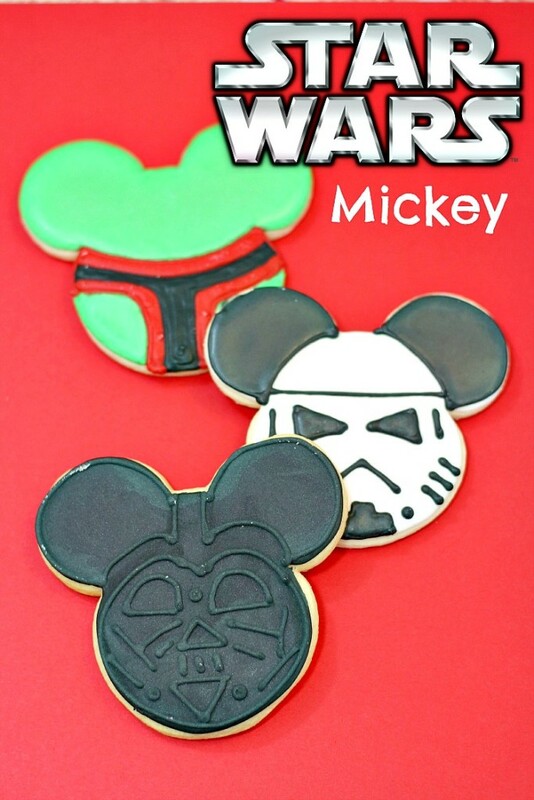 I’m expecting these to go over HUGE with my wife and daughter… Star Wars Mickey Cookies. Enjoy!!! Add all 4 eggs at one time. Continue to mix. Take out 1/3 C of icing add several drops of red gel food coloring. Stir to mix. Divide the remaining icing into three bowls. The first bowl add several drops of black gel food coloring. Stir to blend. The second bowl add several drops of green gel food coloring. Stir to blend. In the third bowl, keep this bowl of icing white. Spoon each color of icing into individual frosting bags with a #2 tips. Twist the open end of the bag to push the icing to the tip. Using the Darth Vader in the picture as the outline. Outline each of the cookies in black. Allow to dry for about 30 seconds before filling in the cookie. Fill in the cookie with the black thinner icing. Allow to dry for about 30 seconds. Squeeze the half of the black of the icing into a bowl then add 1 tsp of water to this and mix it in. Leave the rest of the icing in the frosting bag for later use on the cookies. Next, a little closer to the inner mickey head, draw a top of a heart connecting to the outlining of Mickey’s head. Add the half circle eyes and the dot between the nose followed by a small rectangle nose with two short lines pointing to the outside of the face. Close to those two lines draw one line on each side of the face directly from the corner of the eyes to the mouth. Draw another rectangle for the mouth, between the nose and mouth make three small lines. Refer again to the picture of Darth Vader to ensure the face resembles that picture. Allow the icing to dry for between 5-10 hours. Using the Storm Trooper in the picture as the outline. Outline each of the cookies in white except for the ears . Fill in the cookie with the white thinner icing. Squeeze the half of the white of the icing into a bowl then add 1 tsp of water to this and mix it in. Outline the ears in black . Allow to dry for about 30 seconds before filling in the ear. Fill in the ears with the black thinner icing. 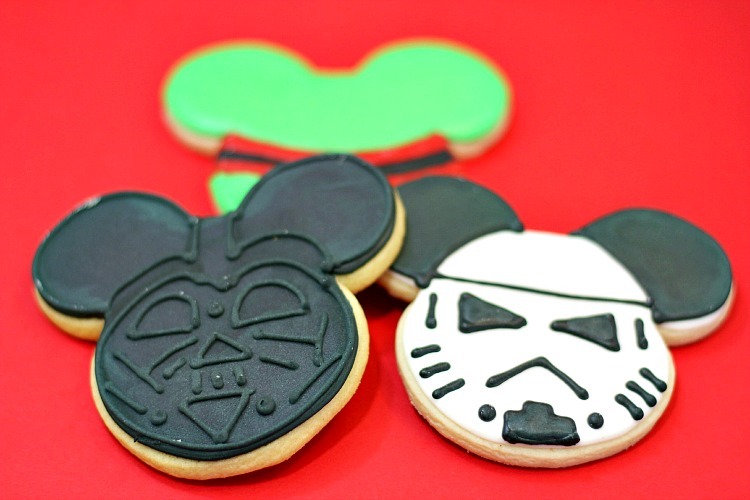 Using the black thicker icing draw a line across the face of the Star Wars Mickey cookies just above the bottom of the ears. Allow a few seconds for this to dry. Move down to the eye area and draw two candy corn shaped eyes laying on their sides. On each side of the cookie where the eyes are, add two straight lines in black. Allow to dry slightly before moving to the next area on the face. For the mouth draw a upside V in black. On each side of the face draw three short lines in the thick black icing. Allow to dry for 30 seconds. For the chin in black icing draw a two tier cake with the bottom layer a littler larger than the top layer. Fill in the layers in the thinner black icing. Allow to dry for 30 seconds. Last step is to add two black dots next to the drawing on the chin. Allow for the cookie to dry for 5-10 hours. Using Boba Fett in the picture as the outline. Outline each of the cookies in green . Fill in the cookie with the green thinner icing. Squeeze the half of the green of the icing into a bowl then add 1 tsp of water to this and mix it in. Following the outline in the picture, draw the semi-circle of his face in thick red from the bottom of each ear. Continue with the red thick icing in outlining the bottom half of Mickey’s face. Fill in center of the face (red icing) with the thick black icing. Allow 5-10 hours for the icing to dry completely. 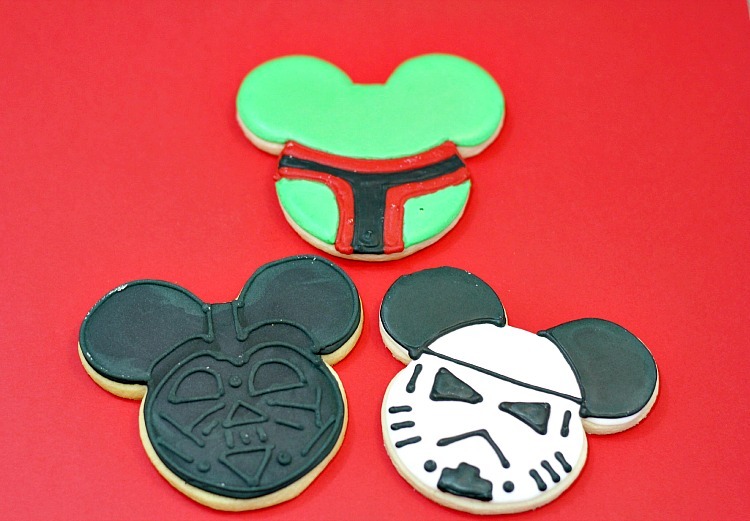 Then eat up the goodness that is the Star Wars Mickey cookies. 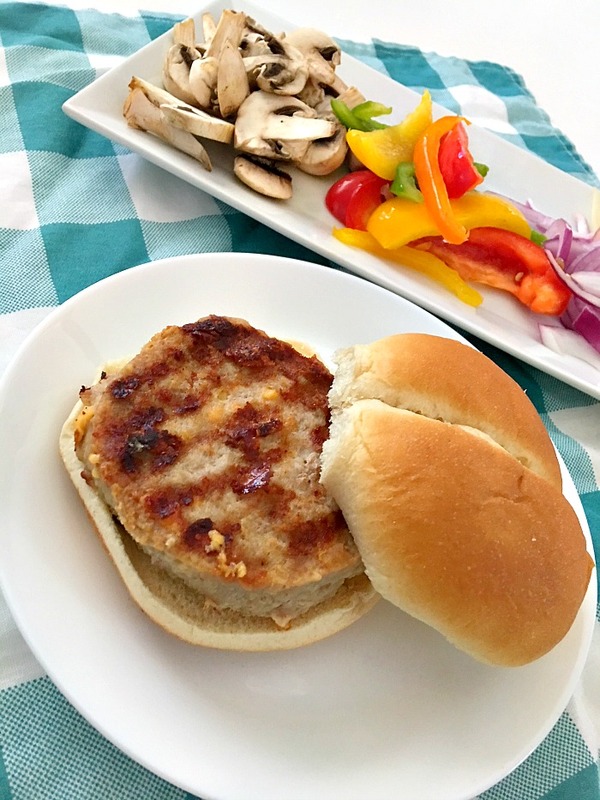 I’m always on the lookout for fun, easy, but never boring, recipes that I can share with friends and family. It has to pair with a good beer to bring the whole thing together. My newest creation is an amazing Chicken Enchilada Dip. 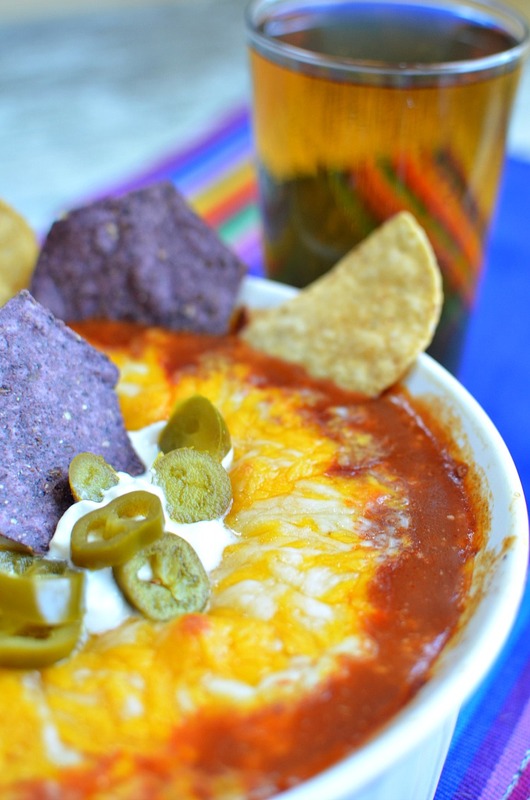 I LOVE Chicken Enchiladas and I’m crazy about dips. So this recipe seemed like a natural culinary partnership. It’s creamy, flavorful and is perfect whether you’re looking for a great snack to make for the family or as a centerpiece for your next Cinco de Mayo celebration. Pour enchilada sauce into a casserole dish or shallow baking dish (a pie dish works well too). Add black beans, corn, and shredded chicken. Sprinkle taco seasoning over whole dish. Bake 15-20 minutes until cheese is bubbly and begins to brown. 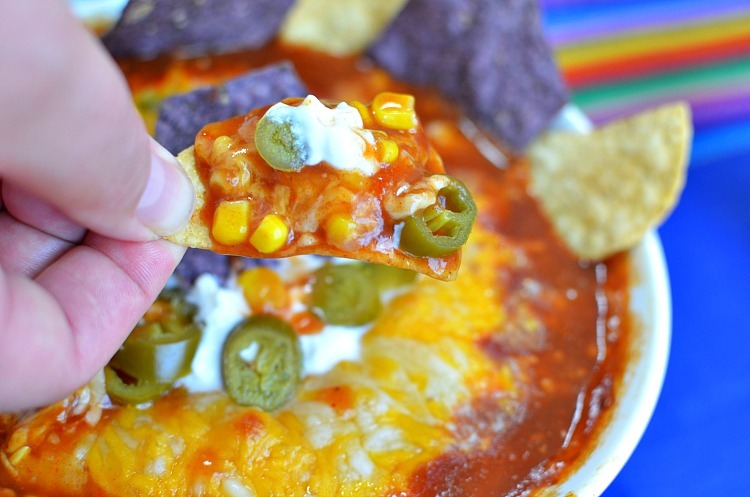 Top with sour cream and jalapenos and serve with tortilla chips. Tortilla Chips and the red enchilada sauce really set off the flavor of the Mexican Pilsner. What are some of your favorite Cinco de Mayo recipes? !